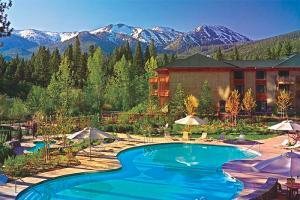 Discover an alpine paradise at Hyatt Regency Lake Tahoe Resort, Spa and Casino. Nestled within the Sierra Mountain Range, the stunning locale of this Four Diamond Lake Tahoe hotel is the ideal setting for year-round pampering. From delicious cuisine and inviting guestrooms to luxurious amenities and services, you'll experience an incomparable mountain escape at this beautiful hotel. Hotel is at corner of Country Club Drive and Lakeshore Blvd.